Prime Minister Narendra Modi termed the 2019 general elections as a fight between nationalists and dynasty rule. 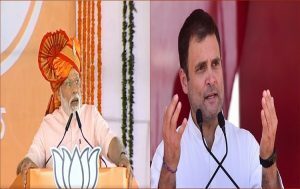 Addressing a public rally in Gangavati of Koppal district of Karnataka Prime Minister said, if voted back to power he will extend the PM Kisaan Samaan Yojana to all the farmers, provide pension to farmers above 60 years of age and open a separate ministry for the development of water resources. Congress President Rahul Gandhi has said that the General Elections is a clash between two conflicting philosophies. Addressing an election rally at Salem in Tamil Nadu, he said the Congress stands for cultural diversity whereas the BJP tries to impose unitary culture throughout the nation. Mr Gandhi said his party’s poll manifesto has been prepared after hearing the opinions of a wide spectrum of people. Earlier, campaigning at Krishnagiri, he said demonetization has severely affected the common man. He said that the GST regime that was brought in a hasty manner has crippled the livelihood of thousands as many small scale industries were closed. He said many manufacturing bases like the knitwear city of Tirupur and the silk capital Kanchipuram were shut down. He said the NYAY scheme to support the poor financially will help alleviate poverty. 66 per cent voter turnout.. Moderate to high polling recorded..
Polling underway for 3rd phase..
PM Modi to address public..
Death toll from series of..
141 dead, 400 Injured in..